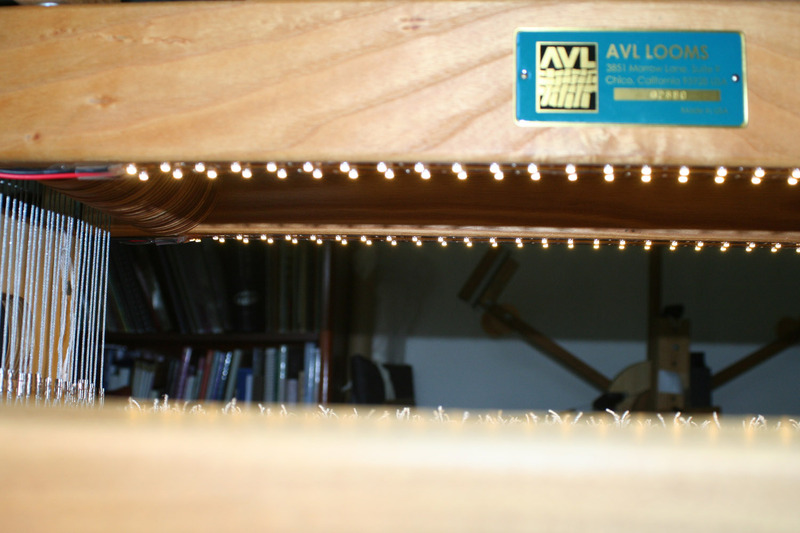 Today I thought I should share the loom-light with Mike, as he was kind enough to wire up some LED strips for me! There are four LED strips on the bottom of the castle (the nearest one is barely visible in this photo), which, put together, provide excellent light for threading and sleying.Â The one drawback is that the light comes from directly above, which means the tops of the shafts tend to shade out the bottom.Â I’m not sure yet how this will play out while threading. I chose the “warm white” variety, so the light is not only effective, it’s beautiful as well.Â They’re like little jewels lined up around the top of my castle (which is below eye level, so there’s no glare). 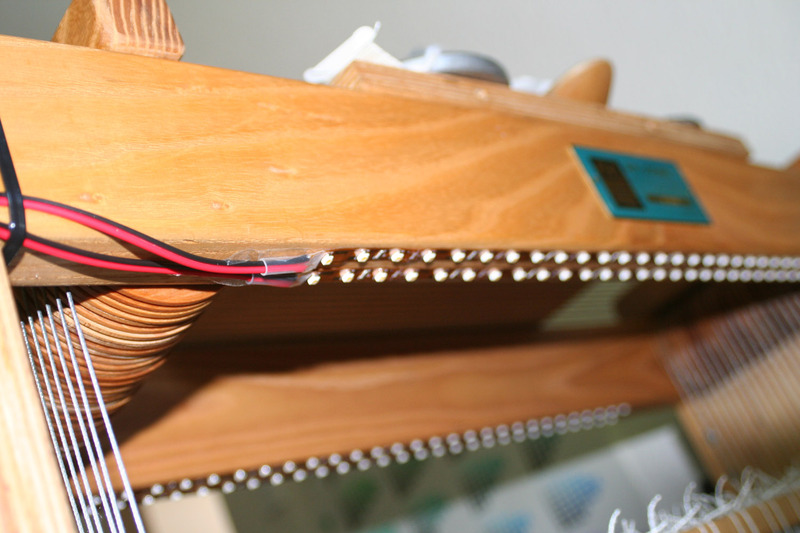 They’re pretty neat – basically a thin, flexible strip of copper with tiny LEDs mounted on the surface.Â It is not quite plug-and-play – Mike had to wire several connections together – but I think you can find kits out there where all you have to do is plug it in.Â And because they’re on flexible strips, you can put them anywhere! 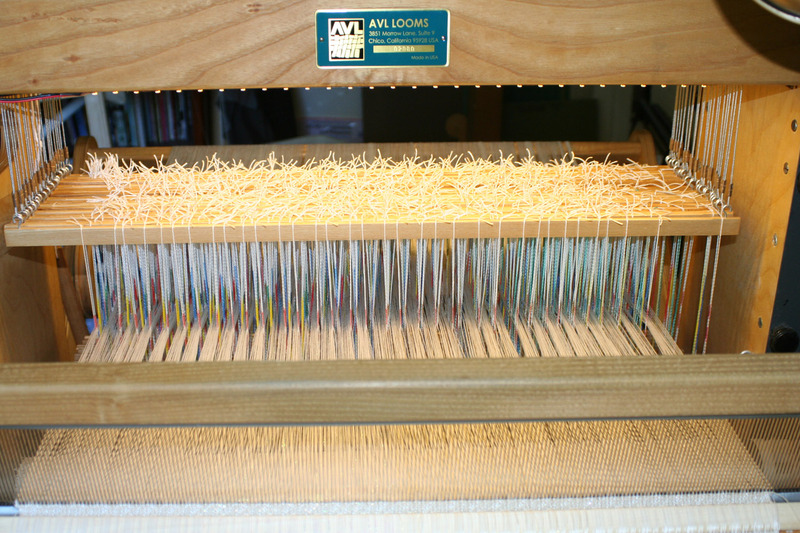 Isn’t Mike great?Â He not only lights up my life, he lights up my loom!Â Who could possibly ask for more?